Internships make a big difference. There are certain things you won't learn in a text book, in a campaigns class or at a portfolio school. There's a whole other reality to the ad world. It's not all shoots and champagne like I said that one time I told you not to get a job in advertising. There are account people constantly scheduling meetings that eat up all your concepting time. There are budgets and lawyers that keep you from doing awesome and amazing things. You'll have multiple, often overlapping deadlines. Project managers running you down. A bunch of people who didn't read this post. Fifty rounds of client changes. Constant rejection. Incessant time sheet reminder emails (or physical enforcers). People throwing you under buses. Weekend work. For little to no money. Knowing how things are in the "real world" and getting day-to-day exposure of the job you want to be in, at a place you want to work at, is going to help you exponentially. 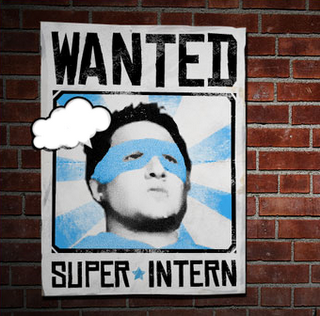 And even if you don't get an internship in the creative department, there's so much you can learn about the process. Plus, your foot will be in the door and you can meet creatives and make connections. I did three internships when I was in college. One in the marketing department of small computer sales company that sold computer parts and products. (Think Dunder Mifflin for geeks). I did a little bit of everything and eventually got used to the 9 to 6 routine. Another, was in account services at BBDO NY. Hated it overall but developed a long-lasting respect for account people. And met some cool creatives who helped me decide to go to portfolio school. Oh! And I got to go on shoots! And the last one was through MAIP, at then Foote Cone & Belding Chicago (now DraftFCB), in the creative department. I didn't have the best experience but I did a lot of work, learned a lot and make some good friends in the process. Also, you can't beat the MAIP network - lots of people who know people you want to know. Check out Internship King. 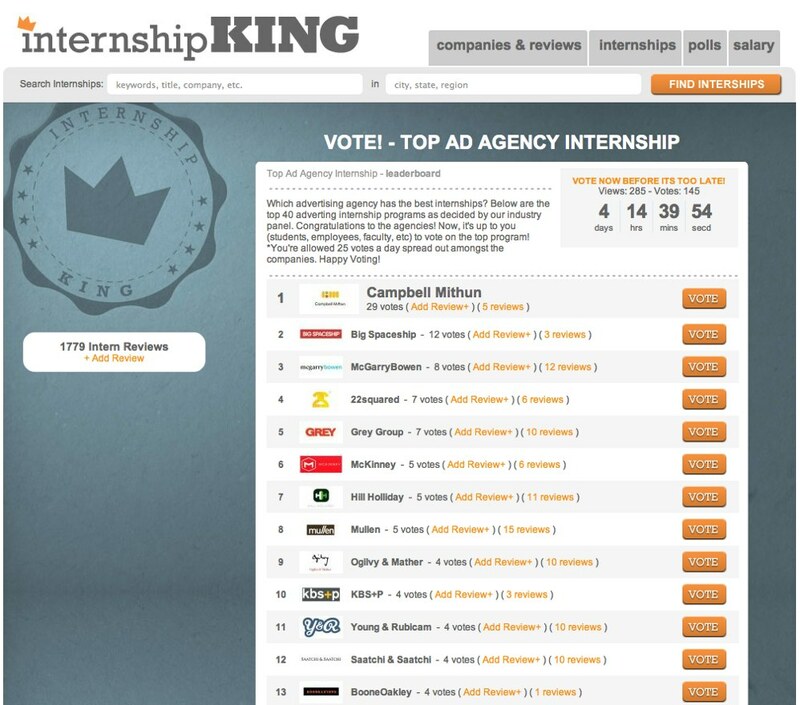 The top 40 agencies to work at are featured with intern reviews (my how the tables have turned). But you can also search by name, city or state to find other agencies - and see some of the ones that made the Worst list. tsk tsk. Say your piece if you're agency is listed. How are they treating you? How is the experience going? Are you learning? Getting responsibilities? Feeling like part of the team? And take notes if you're looking for internships next year. Make a list of the places you want to work at and start trying to find contacts there and doing everything you need to get in there. Agencies often hire from their intern pool so that's always a great step in the door.